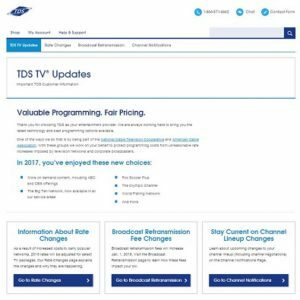 If you’re a TDS TV® customer, there’s a new webpage just for you. 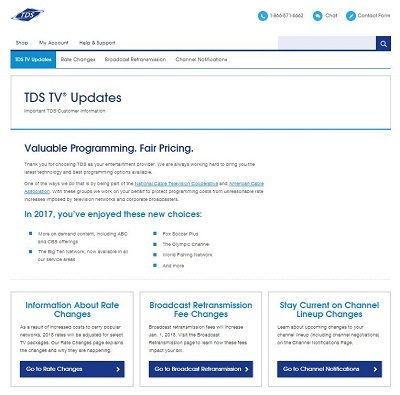 When you visit tdstelecom.com/TVupdates, you’ll get the scoop on any important changes that could impact your service. Why the new spot? We’re routinely negotiating with content providers to carry and add new channels. This new webpage is our way of making sure you’re in the loop on any news you should know about regarding channel-related news. Beyond negotiations and channel lineup changes, the new webpage also has information about another hot topic that could affect your bottom line: broadcast retransmission fees. These fees play a large role in many of our contract talks—and can also impact your bill. We explain this trending issue and share what we’re doing to advocate on your behalf. To find out what’s going on where you live, go to tdstelecom.com/TVupdates and select Channel Notifications. From there you can select your state and city to see the latest information for your community. Rest assured, we’ll still keep you posted on TDS TV news here on the blog. The new webpage is simply a different way for us to keep you, our valued customer, in the know on channel-related issues.